When a tooth has been worn down or is badly decayed, a porcelain crown, sometimes called a cap, can be used. This treatment can effectively restore a single tooth or several teeth. You can see a diagram of how it fits in place shown to the left. 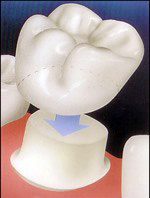 Not only can a crown protect what is left of your natural tooth, but it can be beautiful as well. Bonding technology available today allows the porcelain to be bonded to the tooth without the metal foundation once necessary for dental crowns. That means patients can now have all-porcelain crowns. Porcelain mimics the gloss and translucency of your natural teeth, making a natural looking restoration. When the work is done by an experienced cosmetic dentist like Dr. Noah, no one will ever know you have a crown. When metal is used in the baking process for a porcelain-fused-to-metal crown, an opaque layer is needed to block out the metal which makes the crown look opaque. If all porcelain is used, it can be translucent, just like your natural tooth. With porcelain-fused-to-metal there is also a noticeable black line at the gumline. There are things that dentists can do to try to make this less noticeable, but ultimately it will still be there. With all-porcelain, it is bonded to your original tooth so there is no metal used. This means there will be no black line. You will notice the opaque coloration of the front teeth and the black line where the teeth meet the gums in the left image. None of this is evident in the beautiful, all-porcelain crowns shown in the image on the right. One drawback of all-porcelain is that it is not as strong for back molars. Whereas the metal used in a porcelain-fused-to-metal crown makes it very strong. Many dentists have been performing porcelain-fused-to-metal as the “trusted” solution for years because that is what they were taught in dental school. They may not be completely comfortable with the new bonding techniques or artistic inclination required for all-porcelain. If you’re ready for an all-porcelain crown, You may call our office to schedule an appointment. If you prefer, you may click here to request an appointment online. We also offer a complimentary consultation if you have questions about what crown is best for your specific situation. Dr. Noah will meet with you to help determine the best crown for you.